Sip the beach-y Vincey Rum Punch at the Jerk Shack. Photo by Natalie Fuller. Our local bar and restaurant scene is ever-changing – which keeps things hopping, but also sadly can mean a spot you liked is replaced. Sometimes the new place is worse, sometimes better. Rarely, though, when one restaurant moves in to a space previously occupied by another does it keep the same character – or cigar-box napkin holders. But in the case of the Jerk Shack, which replaced the Innkeeper at 2510 1st Ave in Belltown a couple months ago, that’s exactly what happened. It’s a curious case, as the owners of the Innkeeper are part owners of the Jerk Shack, but have partnered in the venture with Trey Lamont, who also is part owner of the Caribbean-Asian fusion food truck Papa Bois. The staff at the Jerk Shack largely consists of the folks who staffed the Innkeeper, too, and the décor and overall vibe – candles and low lighting; wooden tables, booths, and floor; a few plants; a few island-y art pieces – are fairly consistent with the Innkeeper. But the food menu has changed, with a “jerk” focus, and I could smell the island cooking even in the parking lot on a recent visit. There’s a "jerk fire" section on the menu, headlined by the jerked and fried half chicken – already a big hit and what Lamont’s becoming known for. It’s a massive amount of chicken, served, like most things here, with pistachio rice, Caribbean slaw, and delicious fried plantains that are just the right amount of chewy topped with a tangy mayo. Those plantains also come with the house-made veggie burger, which had a swell smoky taste, topped with that coleslaw and served on a fluffy bun. The sides menu features a jerk mac-and-cheese that has a lovely level of spiciness – one that didn’t overwhelm the lushness of the cheese, but accented it. There’s also a “jerk seafood” section, and Richard the bartender (who prefers one name, like Prince did), swears by the fried whitefish, saying it’s a lot of food, but super light and delicious. Speaking of the bar, a fair amount of the drinks will be familiar to Innkeeper habitués. The Vincey Rum Punch (an import from St. Vincent Island) remains, with its fresh and citrus-y mingling of Appleton rum, key lime, pineapple, and orange juice, plus a little Angostura bitters, grenadine, and fresh nutmeg rounding out the flavor. But there are fresh liquid faces, too, including the Desert Island Paloma. While the regular Paloma (which is Spanish for “dove”) uses tequila mixed with lime and grapefruit juices, here the base is a sage-infused Xicaru mezcal, and the smoky and savory-ness that mezcal delivers make this stand out. 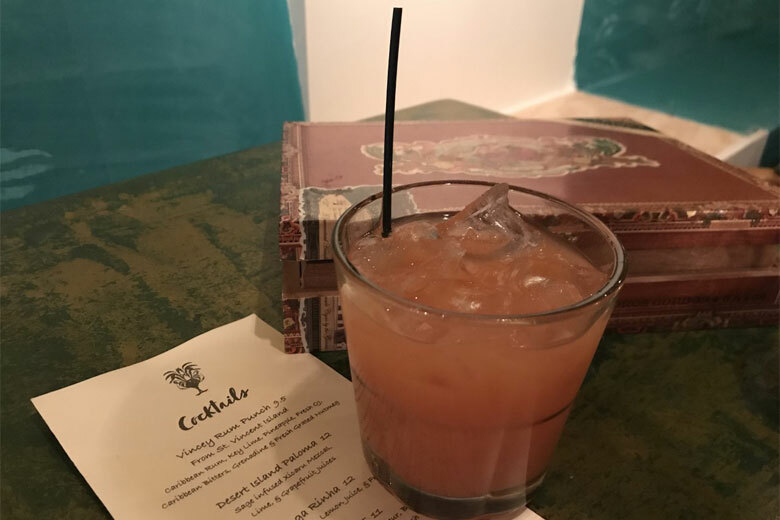 It’s a fun sipper to have at the bar while soaking in the Jerk Shack’s island-style, and also fun to notice how the Innkeeper lives on in the space’s latest incarnation. Best of all, the Innkeeper’s back patio, one of the better outdoor drinking spots downtown, will open up later in the year, once the sun starts shining again.